New York, NY (March 17, 2015) – Today, Iraq and Afghanistan Veterans of America (IAVA) CEO and Founder Paul Rieckhoff unveiled IAVA’s newest version of The Wait We Carry website, www.thewaitwecarry.org, at TED2015 in Vancouver, Canada. 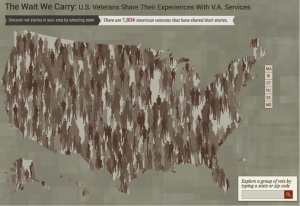 The data visualization tool captures the personal experiences of veterans using the Department of Veterans Affairs (VA) health care system and those who have submitted disability claims for combat-related injuries. Created with support from the John S. and James L. Knight Foundation and in partnership with Periscopic, an industry-leading information visualization firm, the tool offers users a candid understanding of the veteran health care experience. The website was previewed on Sunday, March 15, at the SXSW Interactive technology conference in Austin, Texas, by Jacob Worrell, IAVA’s Director of User Experience. The Wait We Carry currently highlights data obtained from more than 1,800 veterans, including those from the post-9/11 wars and older generations, from a survey launched in the fall of 2014. Veterans and veteran family members wishing to add to the dataset can fill out a brief survey linked from the website describing their experiences with VA disability claims and/or experience seeking health care through the VA. Most notably, when users click on a silhouette, they are taken to a more personal user interface, which tells that particular veteran’s story. Information may include: health ailments; appointment wait times; location they receive VA healthcare; personal photo; and overall wellbeing. Media requests to contact a particular veteran are funneled through IAVA press office. Users are encouraged to share The Wait We Carry through Twitter, Facebook and other social media channels. For more information about IAVA or to sign up for free membership visit IAVA.org. As part of IAVA’s #EndtheVABacklog campaign in 2013, IAVA launched its initial version of The Wait We Carry to highlight the more than 600,000 veterans who were stuck in the VA’s disability claims backlog at its peak in March 2013. By definition, a claim must be waiting more than 125 days for it to be considered backlogged. Over the two years since IAVA launched the campaign, the VA disability claims backlog has been cut by more than 60 percent. Iraq and Afghanistan Veterans of America (www.IAVA.org) is the leading post-9/11 veteran empowerment organization (VEO) with the most diverse and rapidly growing membership in America. Celebrating its 10th year anniversary, IAVA recently received the highest rating – four-stars – from Charity Navigator, America’s largest charity evaluator. Knight Foundation supports transformational ideas that promote quality journalism, advance media innovation, engage communities and foster the arts. The foundation believes that democracy thrives when people and communities are informed and engaged. For more visit, knightfoundation.org.